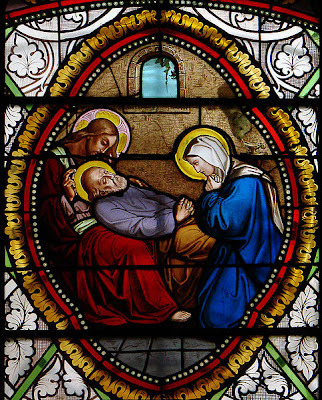 It is perfectly fitting that Saint Joseph has been proclaimed the Patron of a Good Death. Certainly no one can ever have experienced a more serene departure from this life than Joseph's in the physical presence of Jesus and Mary. Let us go to Saint Joseph whenever we are helping someone to prepare for death. Let us ask this help when our time arrives to go to the House of the Father. Joseph will lead us by the hand to Jesus and Mary. After Our Lady, Saint Joseph enjoys the greatest glory accorded to a creature (cf B. Llamera, Theology of St. Joseph). This is only fitting considering his holiness on earth. Joseph gave his entire life to the care of the Son of God and his blessed Mother. Since Jesus honoured Joseph as his father during his earthly life, sincerely calling him "father," He would certainly want to exalt Joseph in heaven after his death (Isidoro de Isolano, The Gifts of St. Joseph).